In the 1920s, Edwin Hubble classified galaxies into two types based on their shape: spirals and ellipticals. Spiral galaxies tend to be blue (though not always), and elliptical galaxies tend to be red. When Hubble first constructed his “tuning fork“, he assumed that galaxies started out elliptical and evolved into spirals, so he named these categories “early-type” and “late-type”. It is now suspected that galaxies generally evolve in the opposite direction, from star-forming disk to passive spheroid. This evolution requires the galaxy to stop forming stars out of molecular gas. This cessation of star formation may be caused by removing the gas from the galaxy entirely or by simply stopping it from collapsing to form stars. The authors of today’s paper set out to determine which of these scenarios is operating in post-starburst galaxies. A post-starburst galaxy is one that has recently undergone an intense bout of star formation, but whose star formation rate is now comparable to an elliptical galaxy. These galaxies are often found in the so-called green valley as they transition from a blue star-forming galaxy to a red early-type. The authors measure the molecular gas content in a sample of nearby post-starburst galaxies, to determine whether they have removed their gas or have simply suppressed star formation. The authors select post-starburst galaxies from the Sloan Digital Sky Survey by choosing galaxies with both strong stellar Balmer absorption lines and little hydrogen emission from star-forming nebulae. Taken together, these are signs of a stellar population rich in A-stars but devoid of the youngest O and B stars, implying that an intense period of star formation ceased less than a billion years ago. Using the IRAM 30m and SMT 10m millimeter telescopes, the authors measured the emission from CO in the galaxies to determine molecular gas mass. CO is the 2nd most abundant molecule in galaxies, so to find the total molecular gas mass, the authors use a conversion factor known as the X-factor. 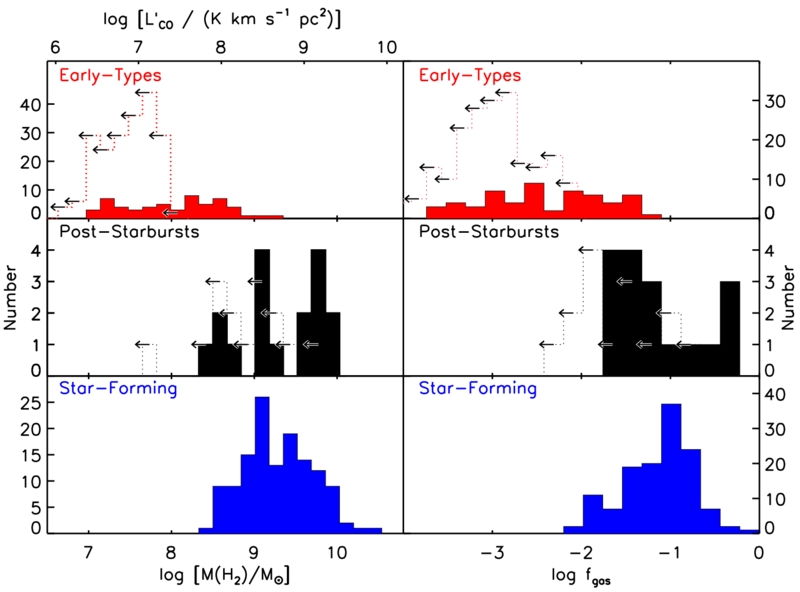 Figure 1 shows the distribution of molecular gas masses for the sample of post-starburst galaxies, compared to reference samples of early-type and star-forming galaxies. Figure 1: Molecular gas content of post-starburst galaxies compared to reference samples of early-type and star-forming galaxies. The dashed histograms with arrows are upper limits. The mass of molecular gas (left) and the mass fraction of molecular gas (right) in the post-starburst galaxies is similar to the star-forming galaxies. The early-type galaxies have much less molecular gas. The Kennicut-Schmidt relation is a relationship between the surface densities of star formation and molecular gas. The relationship holds for spiral and starburst galaxies, and the authors measure the star formation surface density to find to see whether the same relation holds in post-starburst galaxies. The star formation rate is measured using two different star formation indicators measured from the SDSS spectra. The first indicator is the Hα luminosity, which traces the most massive and shortest lived stars, providing a good tracer of the instantaneous star formation rate. Unfortunately, the post-starburst galaxies are largely contaminated by LINER emission, which produces extra Hα emission. Thus, the Hα star formation rates are upper limits on the true values. The second star formation indicator used is the 4000 Angstrom break, a sharp jump in the spectrum of a galaxy caused by calcium absorption lines. A stellar population dominated by young stars has a weak 4000 Angstrom break. Because the post-starburst galaxies were still starbursting less than a billion years ago, A-type stars formed during the burst are still around, causing the 4000 Angstrom break to be weaker than predicted by the low present star formation rate. Due to this timescale effect, the star formation rate derived from the 4000 Angstrom break is also an upper limit. 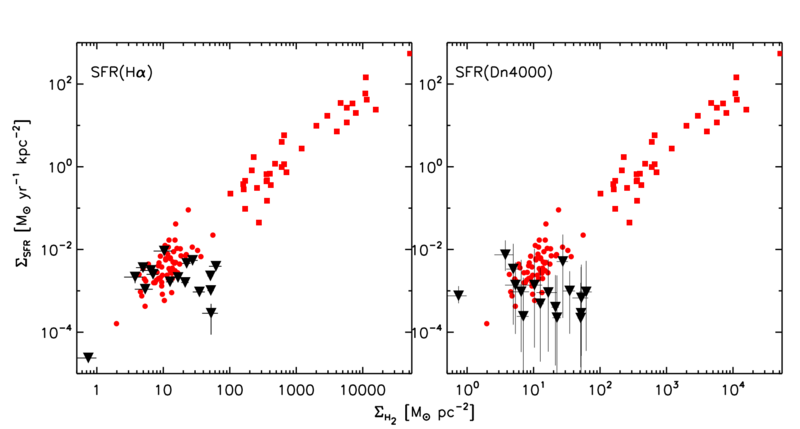 Figure 2: Relation between star formation rate and molecular gas surface densities. The black triangles are upper limits for post-starburst galaxies. The red circles are spiral galaxies and red squares are starburst galaxies. The two panels use different methods to determine the star formation rate of the post-starbursts. Shown in Figure 2, the post-starburst galaxies are offset towards lower star formation rates given their molecular gas masses, compared to the Kennicutt-Schmidt relation for star-forming galaxies. The post-starburst sample has a median star formation rate density approximately five times lower than the median of star forming galaxies at the same molecular gas density. Keep in mind the star formation rate densities plotted in Figure 2 are upper limits; the true values may be even lower. If they still contain lots of molecular gas, why have these galaxies stopped forming stars? The authors conclude that the lack of star formation in post-starburst galaxies is not simply due to removal of molecular gas. They put forward three potential explanations for the offset of the post-starburst galaxies from the Kennicutt-Schmidt relation shown in Figure 2. First, the molecular gas may have a reduced ability to collapse into stars, possible due to gas heating induced by the starburst or an active galactic nucleus. Second, the X-factor may be much lower than in normal star forming galaxies, causing the CO measurement to overestimate the mass of molecular gas. Third, the stellar initial mass function in these galaxies may be bottom heavy, biasing low the star formation rate measurements. Looking to the future, resolved maps of molecular gas and star formation in post-starburst galaxies will provide greater insight into the question of how, and why, galaxies stop forming stars.